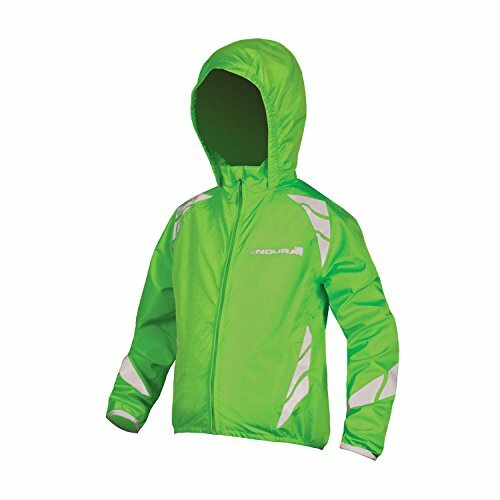 Endura Kids Luminite Cycling Jacket II Hi-viz Green, Small by Endura at Joes V Cycle. MPN: E7113GV/K7. Hurry! Limited time offer. Offer valid only while supplies last. Junior Safety. Fully seam-sealed compact 2 layer fabric with mesh lining. Emblazoned with high visibility 360 degree reflective safety chevrons. Junior Safety. Fully seam-sealed compact 2 layer fabric with mesh lining. Emblazoned with high visibility 360 degree reflective safety chevrons. Vents on the back panel for ventilation. Lycra bound cuff and hem. Rear LED loop. Complete with compact stuff sack.